Senior executives often don’t have enough time or the necessary tools to reach their potential when it comes to their own health and wellbeing. The growing interest in executive wellbeing solutions means that we are witnessing a wave of self-help tricks and fast track solutions – and it is increasingly difficult to assess their quality, impact or scientific base. At the same time, organizational health (healthy teams and a healthy culture) has become an imperative for growth and sustainable business success. This requires new types of leadership skills where both personal wellbeing and organizational health are prerequisites. 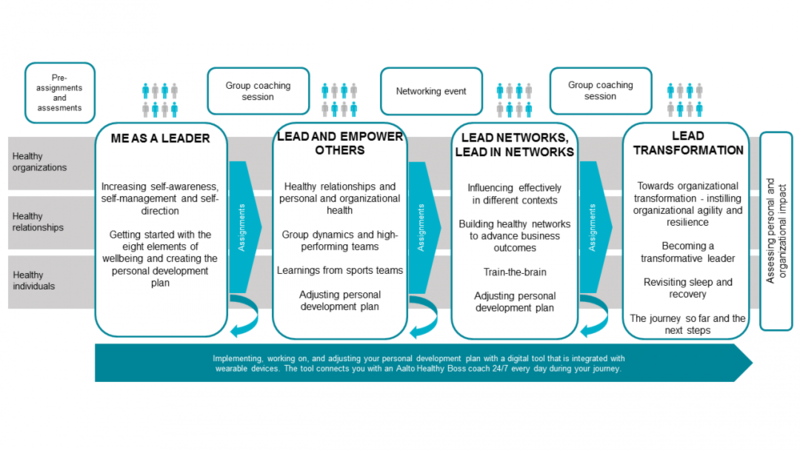 The Aalto Healthy Boss consortium program provides organizations and participants with cutting-edge, scientifically tested, robust approaches to develop personal and organizational health. The program includes participants from 4–5 companies, with a minimum of 5 participants from each company. This gives the participants an opportunity to learn from other organizations and expand their network while taking the learnings to their own organizations. The program has been created in collaboration with Healthy Boss. The Aalto Healthy Boss consortium program is for senior executives and management team members who want to see a change towards better health both in themselves and in their organizations. The learning path follows two streams simultaneously: organizational transformation and personal transformation. Our hand-picked faculty ensures that the content is based on the latest research so that participants can grow into world-class transformational leaders, while the personal transformation stream will help senior executives to stay at the top of their game now and in the future. The Aalto Healthy Boss consortium program provides participants with cutting-edge, scientifically tested, robust approaches. The extensive program consists of four face-to-face modules with high-quality learning methods both inside and outside the classroom. The program lasts approximately one year and we meet face-to-face every 2–3 months in different, inspiring surroundings. Detailed contents of each module will be co-created together with participating organizations. Between modules, participants work on their new healthier habits with the support of an advanced, cutting-edge digital tool. The tool ensures that participants have a coach with them every day of their journey. It integrates leading wearable devices which effortlessly gather all the data needed to improve and maintain wellness. During the program, you will have an experienced health coach dedicated to improving your health and wellbeing, and access to a digital tool that connects you with your coach 24/7. The tool is integrated with wearable devices and combines data on your heart rate, sleep quality, and how much you move during a day – just to name some. In addition to the data produced by the wearable devices, you can personally feed information on your progress, daily habits, meals, exercise sessions, pain points, or how you generally feel that day. Using the vast amount of data points, your trained coach then assesses and improves your health development plan, making any needed adjustments or giving you real-time suggestions. The experience is highly personalized and you’re not stuck with a rut – if something doesn’t work out for you, the coach is dedicated to finding out the core reason and adjusting the plan accordingly. Did you skip your evening run because you felt exhausted after a long day? Don’t worry. Share this information with your coach, and they will help you not to to miss it next time. Using your personal data, your coach might realize that you didn’t get enough deep sleep the night before, or that your snacks made your blood sugar levels to raise too high. The answer might be simple – or it might require the coach to assess several data points before finding the best solution. Ultimately – it is not the tool, nor the data, but what your coach does with the data, that makes the development journey so personalized, comprehensive, and effective. In Aalto Healthy Boss, you will have a coach with you every day during your journey. Melissa Jones Briggs is a lecturer in Organizational Behaviour at Stanford Graduate School of Business. She has extensive experience in exploring the relationship of power, authority and status, and how nonverbal communication can help achieve leadership goals. Jones Briggs works with organizations like Intel, Twitter, Lyft, Mozilla, Cisco, eBay, Ubisoft, London Business School, The Clayman Institute for Gender Research, Singularity University, Lorraine Packard Children’s Hospital, Stanford School of Medicine, and Stanford Hospitals & Clinics. In her teachings, she elevates the executive presence and authority of leaders by combining research from the fields of social science and the practical application of performance techniques. Jones Briggs’s research and teaching interests include interdisciplinary performance practice; psychology of performance; quotidian application of performance craft in public and private life; methodology of coaching; practices of theatre technique that build social cohesion and community resiliency; the role of informal arts play in personal and organizational development; and design theory and pedagogy. She teaches acting techniques to help students perform effectively within networks and hierarchies, a crucial determinant of professional and personal success. She helps her students to broaden their repertoire of physical, vocal and emotional tools to enhance their impact and connection in a leadership context. Melissa Jones Briggs studied at the Royal Academy of Dramatic Art in London and The Actor’s Center Conservatory in New York. She is an honors graduate from Wake Forest University (USA). She has also worked as a theatre and film actress in New York City and San Francisco. Vernon B. Williams serves as an MD, Sports Neurology at the Healthy Boss. He joined Kerlan-Jobe Orthopaedic Clinic 1997 and is a consulting Team Physician to the Los Angeles Rams, Lakers, Dodgers, Kings, Sparks, KISS and Anaheim Ducks. Dr. Williams is an active educator on sports neurology and concussion and Chair of the American Academy of Neurology Sports Neurology Section. Dr. Williams is a board-certified neurologist (certified by the American Board of Psychiatry and Neurology), focused on the field of sports neurology. In athletics, education and even job performance, our brains are working non-stop, sending signals to our bodies that compel them to act in very specific ways. Dr. Williams’ passion is studying and understanding how the brain and nervous system work together to make people perform. Marko Yrjövuori is the CEO and Founder of Healthy Boss. As a wellness and sports medicine professional, Marko has worked with the highest level athletes and teams in the world. Yrjövuori was a member of the medical staff of the NHL team Los Angeles Kings (athletics trainer and sports therapist 2000–2003) and of the training staff of the NBA team Los Angeles Lakers (athletics trainer and head sports therapist 2003–2016). Marko is a lecturer at the Olympic Training Center Kuortane in Finland. His programs are well recognized in the USA, Australia and Finland. Marko is an owner of the performance training company MYC-Training. Numerous NBA, NHL NFL, UFC and Olympic athletes have used his services to perform better in their field of sports. Markku Partinen is a neurologist and director of the Helsinki Sleep Clinic, Vitalmed Research Centre, Helsinki, and Principal Investigator of Sleep Research at the Institute of Clinical Medicine, University of Helsinki. Partinen has held many international positions in different research societies including Member of the Scientific Board and Vice-President of the European Sleep Research Society, and President Elect and President of the World Association of Sleep Medicine. He worked as a researcher at Stanford University, USA in 1985–86 and in Bologna, Italy in 1987, and has published more than 330 original international articles and several books, in addition to more than 300 reviews and book chapters. Professor Partinen is an internationally sought-after speaker. He has a holistic approach to combining the three main elements of brain health: sleep, nutrition and physical exercise. Dr. Partinen has worked with many high-level business leaders, top level athletes including Olympic Games winners, and other experts. He has tools to screen for insomnia, sleep apnea, fatigue and sleepiness. By measuring sympathico-vagal balance combined with sleep recordings using modern digitized technology, he can recognize possible problems and make individual plans to help people be alert and vigilant when awake, and to sleep well when it is time to sleep. Graham Ward serves as an Adjunct Professor of Organizational Behaviour at INSEAD. Graham’s expertise is in transformational leadership, high performance teams, group dynamics, team dysfunction and change. Graham consults around the psychology of leadership, the application of fair process in teams, sustainable relationship building and developing high performance teams and culture in organizational life. He is a trained executive coach and works with both individuals and teams in this capacity, generally at EXCOM level. He is also Adjunct Professor of Organisational Behaviour at INSEAD Business School in France and is the academic director of a number executive programs. He has worked as visiting faculty at the Stockholm School of Economics in Sweden, Moscow Higher School of Economics and ESMT in Berlin. Graham spent more than 17 years at Goldman Sachs (GS), a US investment bank, both as a business leader for nine years and latterly spearheading an initiative to introduce a Global Leadership Development office that he led for three years. Graham received a PhD from the Economics Faculty of Vrije University in Amsterdam in 2014 and holds an MSc and Diploma in Clinical Organizational Psychology from HEC/INSEAD. In 1994 he received a Diploma in Investment Management from London Business School.